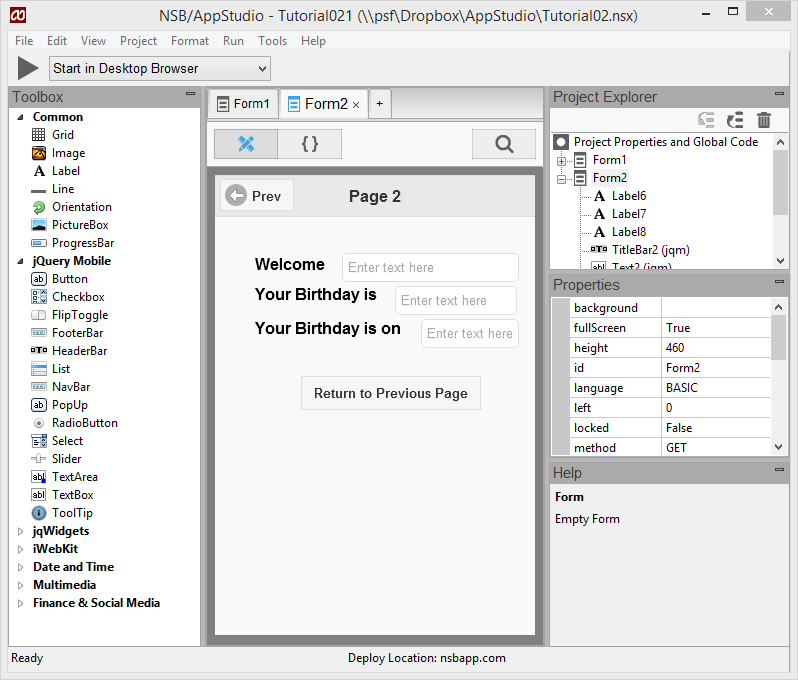 The purpose of this tutorial is to help learn a few more AppStudio programming techniques. You should complete Tutorial #1 before beginning this tutorial. In this tutorial, the techniques of using multiple forms and Select controls will be covered. The program to be developed has two forms. 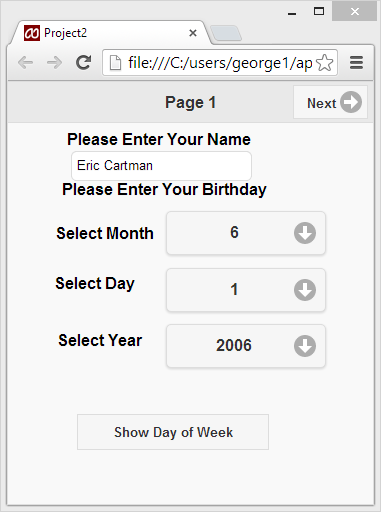 Form #1 allows the user to enter a birth date and name. Form #2 shows the values of the previously entered birth date and name plus it tells on what day of the week the birth date occurred. There is a Title Bar and a button on each form that will switch between forms. Form factor should be iPhone/iPad/Nexus. Add a Title Bar for form1. In the properties window, set the leftButtonStyle to "blank", the leftButtonIconTo false and change rightButtonName to "Next". Change the title to "Page 1" and put Form2 in changeform. Drag a label to the desired location and make it wider. Set its textContent in the Properties window to "Please Enter Your Name"
Add a TextBox. It should name itself TextBox1. In this tutorial, we rename it to Text1. Add 3 Select controls, drag into position and resize. Finally add a Button to the form. Resize and change the value property to read "Show Day of The Week". 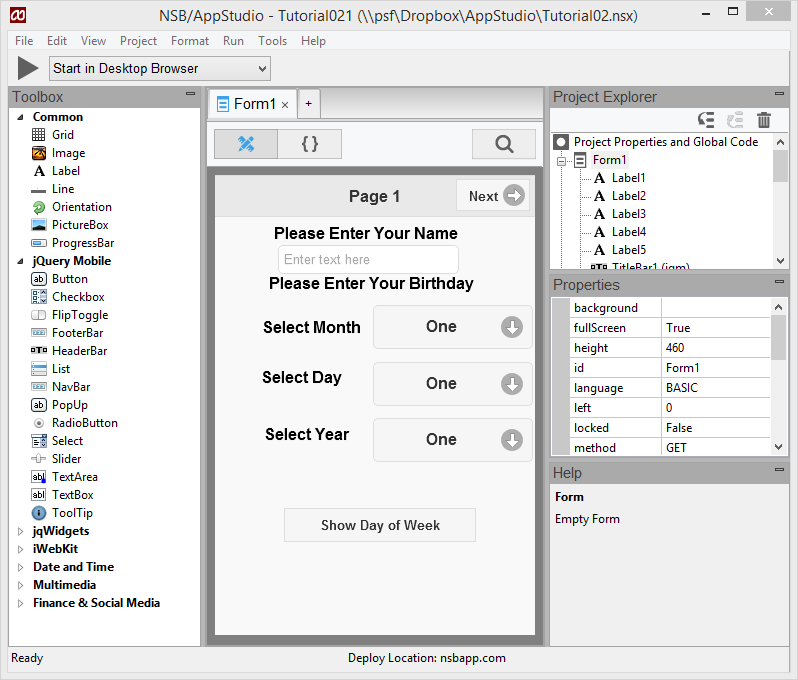 On the IDE menu select "Project" followed by "Add Form". Add a Title Bar for form2. In the Properties Window set the rightButtonStyle to "blank", the rightButtonIcon to false and change leftButtonName to "Prev". Set the Title to Page 2. Set leftChangeForm to Form1. In the properties for each label change the Text property to "Welcome", "Your Birthday is" and "Your Birthday is on". Now add 3 Text boxes and drag into position. Lastly add a Button. Resize and change the value to read "Return to previous Page". Set changeform to Form1. We have completed the visual design of our program so now it's time to add code to make it do something. The 3 Select loops above set up the Months 1 to 12, the Days 1 to 31 and the Years 1900 to 2010. The three above functions assign the selections from the Selectes to three variables a, b and c.
When Button1 is clicked, the following happens. The values of a, b and c are concatenated together with "/ " to form MM/ DD/ YYYY which is assigned to birthday. The internal WeekDay function is called and the Weekday value is assigned to dayofweek. The internal WeekdayName function is called and the WeekDayName value is assisgned to Text4 which will appear on the form2. Form1 is hidden and Form2 appears. If "Next" is selected on the form1 TitleBar then form1 is hidden and form2 appears. From the IDE menu select "File" then "Save Project" or "Ctrl S" or the Save Icon from the Tool Bar. We can run the program again. Choose Run...Start in Desktop Browser. If all goes well the forms should appear similar to those shown below. Congratulations... The only thing left to do is deploy the program. This page was last edited on 17 March 2019, at 21:04.